My daughter has several friends that require special accessibility accommodations for their disability; some for ADHD, some for medical issues. And, one of our interns needed the services and found that the UF employee she met with during her intake meeting was extremely understanding and helpful. She now takes all of her exams at the DRC and has extra time to take them. UF is large and frankly, can be rather overwhelming, but the Disability Resource Center is there to create an inclusive educational environment for all students by way of academic accommodations, testing support, assistive technologies, and coaching. The DRC is partnered with U Matter, We Care at UF. Some accommodations offered by the DRC include, but are not limited to, note-taking services, extended exam time, low distraction exam setting, alternative format textbooks, priority registration and a reduced course load. A complete list may be found here. Additionally, Learning Strategy and Coaching sessions are available to registered DRC students to provide educational and solution-focused support in a one-on-one setting. Topics include learning strategies, test-taking strategies, copy skills for stress management and transitioning to college. Prior to your first meeting, which cannot happen until after you have attended orientation, students must submit an application. Be sure to provide any available documentation that indicates a history of a disability diagnosis. These steps will save you time later, but do not hesitate to attend your first meeting because you don’t have all the documentation together. You must register with the Disability Resource Center and have a mandatory intake appointment prior to the beginning of the semester. New incoming students can begin this process during preview. Personally, I recommend each student meet with their professor early on to discuss their accommodations. Students will be provided with accommodation letters to give to their instructors by the DRC. It is recommended that they give their instructors this letter during the first two weeks of class as the specific disability is not disclosed. While students are not under any obligation to share their disability, it is up to them if they want to share that information. If students need special transportation due to mobility-related disabilities, even if it is temporary, they can take Gator Lift, a free shuttle service to accessible locations within the UF campus. They will need to make an appointment as Gator Lift does not accept same-day ride requests. Disable Decals are available annually, by semester, monthly and weekly should your student require one due to a disability. Click here for eligibility and pricing. If your student injures themselves and requires special parking, they will need to have a doctor’s note and apply for a temporary parking pass that would give them access to certain color-coded parking areas. It is only valid for 30 days so if their injury requires more time, they would need to reapply. For students with a state-issued Disabled Persons Parking Placard, you do need to purchase a UF Disabled Persons parking decal. For decal types, eligibility and prices, click here. Disable Decals are also available monthly and weekly should your student require one due to an injury. Service animals are allowed with some restrictions. See policy here. Emotional support animals are allowed in campus residence housing only and not in other campus facilities. To apply to bring a service animal or emotional support animal to live with them on campus, click here. Every student is quite obviously different; therefore their plan should be too. Encourage your student to begin the process early. 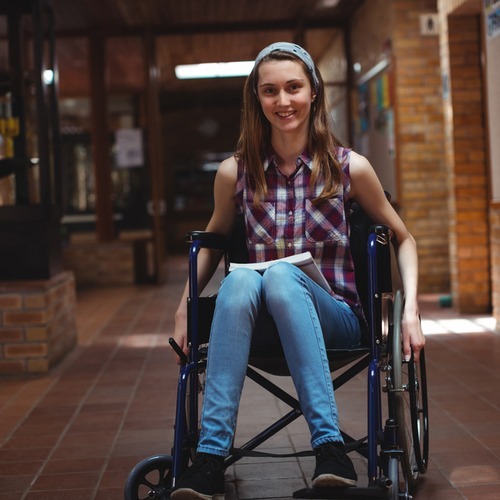 Setting a plan into place and/or making sure their campus is fully accessible can most definitely ease the pressures of college as well as make a very large school feel smaller.